The muscle on the backside of the forearm with three heads or origin is commonly known as triceps. The joint action of the three heads to straighten our elbow. The triceps muscles can be felt like a tense muscle on the back of the upper arm while doing the push-up exercises. As, it has three heads, or origin, such as the lateral, long and medial head. So its full name is Triceps Brachii. Various daily activities are involved with this triceps as it is primary muscles that execute our upper limb straitening. Being different in bone construction, from its cousin biceps, on the front of the humerus, triceps do not get the proper attention of body builder and gym goers, but as far as the muscle activities are concerned, it has the equal importance as biceps. So here are some tricks and tips to build up your triceps for those whose muscles pop up in front but lag in the back. 1): Close Grip Bench Press: This is a multi-functional exercise as it gives the bodybuilder the best result regarding muscles growth. It works best as it involves multi-joint that increase all the three points of triceps. This workout extends the elbows as the muscles work for itself. To grow your triceps use a close grip (8—10 Inches apart) so that no extra stress on your arm. Also, it increases the strain on the wrist and emphasizes the lateral point of the triceps. To start with, lie down on a bench and hold a close grip straight over around the bar. Held it straight. This is your first step. Then as you breathe in, you have to come down slowly then bring the rod in the center of your chest. Be sure to keep the elbows near to the torso, so that your triceps get the maximum exercises. If you are a beginner, always try to use a spotter, or you can use less weight. 2): Dip Machine: To start the Dip machine exercise you need a Dip machine, and you have selected the weight according to your ability. To get on to your starting position you have to sit securely on a dip machine and grasp the handle firmly. Keep your elbows at the side, so that it could be bent at 90 degrees. As you exhale, contract your triceps and extends your arms. Bring your arms to the starting position as you inhale. Always try to do this dip Machine exercise at the beginning or in the middle of your workout routine for 3-4 sets of 6- 10 reps.
3): Triceps Extension Exercise with EZ Bar: It’s one of the simple triceps workouts that will shape your triceps in both sizes and also make it strong enough. Though it strengthens the whole triceps, it works mainly for the upper triceps. To start with, lie flat either on a bench or the floor with an EZ bar. Hold it with a shoulder width grip and keep it your arm in upper position straight on your chest level. Bend your elbows and lower the weight while coming down towards your head. Straighten your forearms and push back the weight up when your forearms come Parallel position with your body. Be careful and keep in mind while doing this workout that, due to the position of your elbows, using heavy weight at the beginning can cause an injury. So if you experience any such elbow pain, you should lower the weight and move upper arms creating an angle rather keep it perpendicular to your body and make a little movement of your elbows. 4): Seated Overhead Dumb Bell Extension: Work out with the dumb bell in the different position is a common but very useful exercise to build up a strong and big size triceps muscles. You must select a utility bench with a back support with two dumbbells on your hand. Place the hand onto your thighs and hold it straight up on your shoulder level. This is your starting position. Keep the dumb bell in a manner that your palms stay in the forward direction. Now as you exhale slowly push up the dumb bell up to your head so that both dumb bells touch each other. Pause for few second and now inhale and bring back the dumbbells in starting position. Do it as per your recommended repetitions. 5): V- Bar Pulldown Exercise: To perform this task you need a pull-down machine with a V-bar attachment. Take your seat facing the machine and adjust your knee pad according to your height. The pad will resist your body from being uplift by the resistance of the pulley. Grab the v bar firmly with your palms facing each other. Now lean backward at about 30 degrees and stick your chest outwards. This is the starting position. Now, by using your Latissimus muscle pull down the V-bar by squeezing your shoulder until the bar touches your chest. Do exhale while doing this. After taking a pause for a few second in the contracted position, and slowly get back to the starting position as you breathe in. Keep in your mind don’t use so much weight so that you have to swing your torso while pulling the V-bar. A): Never Start with Press Down: All the beginner gym goers should not start their fitness work out with press down and heavyweight. Any types of press down exercises such as overhand, underhand, rope and V- Bar will only work for your triceps as they are single joint exercise. You should choose some multi-joint exercises like close grip bench press, Triceps dip machine exercise, etc. that will warm up all the muscles of your body, and slowly your body muscles will be tuned up with your activities. B): Try to improve your triceps using your body weight: This type of exercise will do better work for the growth of your triceps. This workout is almost like push ups, but here you have to use a Bar to hold on for support. You can do this at your home. C): choose different angles: To increase your ability to fitness workout you should play with the angles. 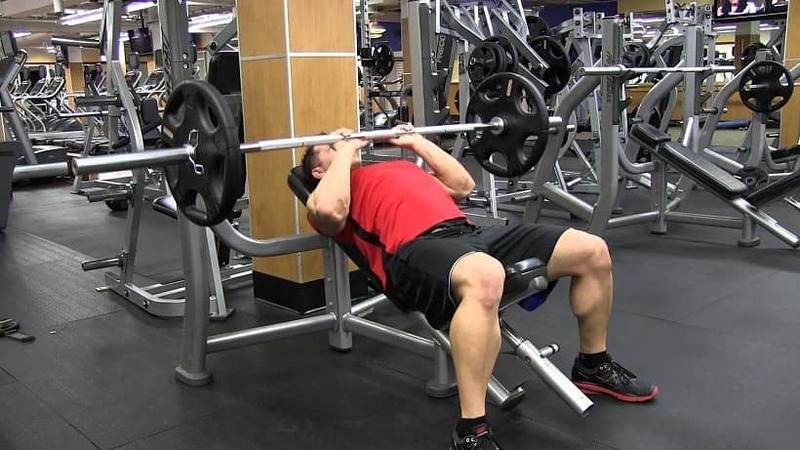 It’s not necessary to do close-grip bench press exercise using a flat bench; you can use incline or decline surface which will change the angle of your exercise and work for different muscles. In this way, you can alter and add maximum add number of muscles and stimulate them by a single activity. D): Choose your weight, Rep change and set change following the trainer’s guideline: Always follow the rule set up according to your height and weight by your teacher unless you get accustomed to it. Always keep in mind a lower Rep change for any beginners is 1-5 Reps, and the medium is 8-12 reps. Your muscle growth fully depends on how much weight you are lifting, but initially, you have to start with lower weight. E): Take enough Protein: As we all know protein is the muscle builder nutrients, so make sure you are taking enough protein in your daily diet and in between the workouts. So these are few tips and tricks that will guide you to grow your triceps in a proper way. As its necessary to do weightlifting and tough workout to improve your triceps, so be patience enough to improve it gradually with an appropriate and perfect diet plan. How to be Financially Prepared for Critical Health Problems?